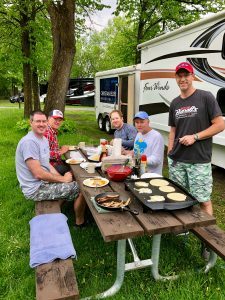 We awoke in Cloquet to a pancake and sausage breakfast made by Justin and Matt, and we had a plan. Sometimes plans work better on paper, as we would see again today. We drove to our starting point on the Mesabi Trail in Fayal for our first 20 miles to Aurora. We have ridden this section of the Mesabi only one other time, since portions of the trail have been closed around Virginia for nearly 3 years. We enjoyed a nice ride along the trail until we came to a torn-up section outside of Gilbert; luckily, we managed to walk through to the other side. A little further down the trail we approached a downed tree on the trail. Justin and John K. had already crossed over and said later that they didn’t even think about clearing the trail. When Kyle and Dennis reached the tree, they decided to clear it, at Dennis’ suggestion. Dennis volunteered to take a photo while Kyle moved the tree, which Dennis thought was a brilliant idea, definitely within his delegation wheelhouse! There is no trail yet from McKinley to Biwabik, so we jumped on the highway in a 4-mile peloton, paced by Dennis. Kyle push drafted the other riders a couple of times as we cruised into Biwabik, although we wouldn’t recommend this at home. Back on the trail we proceeded toward Aurora for our planned hookup with Matt, who had set himself up at a beautiful park pavilion. Unfortunately, the park pavilion was also hosting a graduation party that afternoon, so Matt had to hurriedly pack up and find another spot. Just after he set up again, he received a call from John K. letting him know that he needed to meet the boys in Biwabik. 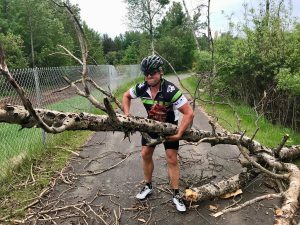 Yep, the riders had come to a huge impassable section of trail on the way to Aurora, a closing that was not highlighted on the Mesabi Trail website, of course. It had begun to rain, so we opted to load our bikes, skipping the highway ride, and restart in McKinley. 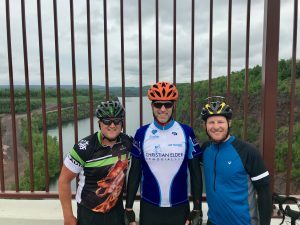 We rode from there into Virginia on the new section of trail, including a scenic new bridge where we stopped for a photo op. From here we meandered through Virginia, crisscrossing city streets, riding through alleys, parks and on sidewalks in a seemingly endless ride. At one point John missed a turn on the poorly marked trail, extending his trip through Virginia even more. By the time we left Virginia, it was mid-afternoon, and we were just over 30 miles into our ride. We continued on the trail through Mountain Iron and on to Buhl, Kyle and Dennis on a spirited race most of the way. No Kyle, taking an unmarked shortcut is not cheating; rather, it is a savvy veteran move! 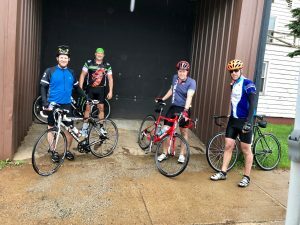 The rain started again in Buhl, and we had a wet ride all the way to Keewatin for our finish. Although we were drenched by the end of the day, we all agreed that the ride in a steady rain was actually quite pleasant. Our plans changed again as we opted to drive to Grand Rapids for our overnight stay in the Itasca County Fairgrounds. Matt was pitching for dinner out again tonight due to the rain, but we opted to open the canopy and set up the grill for ribeye steaks and veggies. It was delicious, much better than the “Fine Dining” from the previous night. We completed our day with desserts and a nightcap before heading to bed. Tomorrow’s plan is for an early start…hopefully our plans will work better than today.